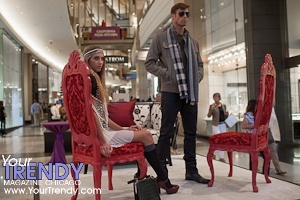 The Shops at North Bridge on Michigan Avenue and CS Modern Luxury featured Chicago's best stylists, fashion bloggers and fashionistas as they picked the hottest new looks for fall and competed to win fabulous prizes. Guests voted for their favorites and enter to win amazing giveaways, all while enjoying live music, bites from Chicago’s top restaurants and one-night-only specials and promotions throughout the evening. Featuring fall looks from: Nordstrom, UNITED COLORS OF BENETTON, White House I Black Market, LOFT, Tommy Bahama, XXI Forever, Made in Chicago presented by AIBI, and Lucky Brand. Neiman Marcus celebrated FNO with an over the top Fall Fashion Show hosted by Corri McFadden, owner/founder of eDrop-Off and star of Vh1's House of Consignment, delicious tastings from some of Chicago's top restaurants including RPM, Paris Club, Rosebud on Rush, Ai Japanese Restaurant, KIND Healthy Snacks, More Cupcakes and Popchips. Factor Runway Model Search, Manicure Mania Nail Bar and Fashionista Photo Booth, plus a lipstick bar. Saks Fifth Avenue and Chicago Sun-Times hosted Fashion's Night Out and the launch of the paper's new Sunday Splash. Guests enjoyed cocktails, hors d'oeuvres and music as they shoped the latest arrivals for fall. Hosted by Amanda Puck, Kimberly Burt, Kristina McGrath, Lauren Buxbaum, Lisa Frame, Liza Sweitzer, Sam Saifer Berngard, Sherri Hoke and Susanna Negovan. In honor of the highly-anticipated Fashion's Night Out 2012, The 900 Shops teamed up with Michigan Avenue Magazine and McGrath Lexus and Acura of Downtown Chicago to host its 2nd Annual 900’s Night Out: Fame, Fashion & Flavor. This over-the-top event was hosted by celebrity, Ali Larter. Runway show featured fall’s hottest looks from all of your favorite shops including: Bloomingdale’s, DNA2050, L.K.Bennett, Karen Millen, UGG Australia, DEKA Chicago. Nzimiro Optua from NBC's 'Fashion Star’ collaborate with 3 local Chicago bloggers to tackle fall’s fashion trends for men and women at Macy's on State Street. Shoppers had the chance to meet Aviva Drescher, from Bravo TV’s The Real Housewives of New York City! In addition, featured fashion analysis from the Bumbys, treats from Sweet Margy Confections, a culinary demo from Macy’s Executive Chef Brad Saylor, wine and craft beer sampling from Louis Glunz Wine & Beer, and much more.